While hiking can be fun and adventurous, it also is physically demanding and requires you to be in good shape. 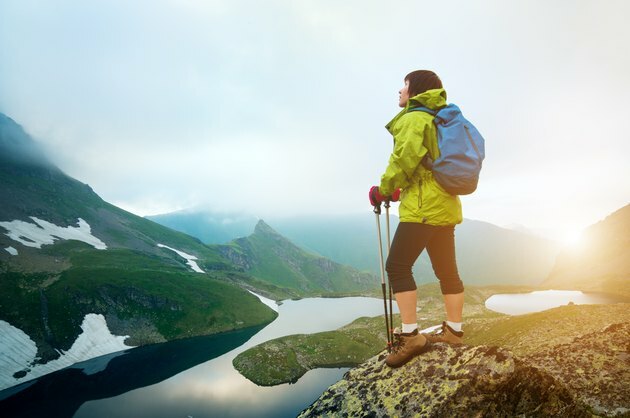 Depending on your current fitness level and the hike's difficulty, you will want to give yourself anywhere between two to eight weeks to prepare your body for hiking. Hikes that are longer in length and more difficult in terms of steepness will require you to be more fit than hikes that are more leisurely or shorter in distance. Choose a hike you realistically can complete after a few weeks of focused training. Engage in cardiovascular exercise five days of the week for 30 to 60 minutes per session. Workouts should be done at a moderate intensity in which you can carry on a conversation but still are breathing heavier than usual and working up a sweat. Do cardio that works the major muscle groups in the lower body since the legs are predominately used in hiking. Running and cycling are good options as well as stair-climbing at the gym or the local stadium. Include hills in your workouts to simulate a hilly hike. Strength train two to three days per week in preparation for hiking. Strength training will build up your lower and upper body, particularly important if you are carrying a heavier backpack with food and basic essentials. You do not need to put on a lot of muscle bulk for hiking as the heavier mass potentially could slow you down. Rather, lift for general strength and conditioning by selecting six to eight exercises per workout for the arms, shoulders, chest, back, legs and gluteals. Choose a weight that you causes fatigue by the 12th or 15th repetition, and complete two to three sets in total. In addition to a structured exercise routine, aim to incorporate more physical activity into your everyday life. Take the stairs at work whenever you need to switch floors and even during a lunch break for extra exercise. Walk to work or park a couple of blocks away. Get out your push-bike and cycle around the neighborhood with family. All of these activities increase the heart rate and get the muscles pumping in preparation for hiking a trail in your future. Adopting healthier eating habits in the weeks prior to your hike will boost energy levels and fuel muscles for extended exercise. Poor eating habits will leave you lethargic and weak, so avoid foods high in fats, particularly trans and polyunsaturated fats in favor of low-calorie, nutrient-rich vegetables, fruits, lean proteins and monounsaturated fats. Healthier eating also will help you drop excess pounds if you drop your overall caloric intake. This will make your hike easier and more enjoyable.